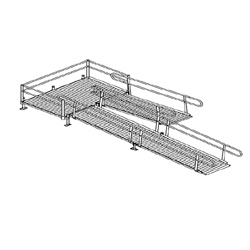 Kit includes: Two ramp sections and one turnback platform. Choose ramp lengths, all installation hardware included. The Adaptive Living Store Modular Kits are complete solutions, our Modification Specialists ensure all necessary hardware is included in your purchase price. EZ-Access® Modular Ramps offer quick and convenient installation and removal. Made in the U.S.A. Please reference the Incline Chart to define Rise In Inches for planning of safe ramp slope. The Adaptive Living Store strongly recommends following ADA Guidelines when installing ramp solutions. This durable ramp system is designed for a clean and modern appearance in residential and light commercial settings, and features handrails with a brushed architectural finish. Constructed of lightweight aluminum, this low maintenance ramp does not rust, rot, or decay. This ramp consists of universal components to ensure fewer parts, and requires minimal assembly. The sides are finished and flush, with no hazardous nuts or bolts protruding into usable ramp area. With no anchoring into concrete footings or pads required, the ramp can be easily expanded, reconfigured, or moved. The complete kit includes all of the necessary hardware for installation.